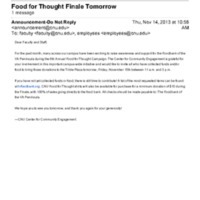 Flyer for the 2009 Food for Thought canned food drive for the Trible Library. 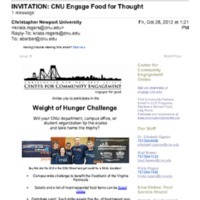 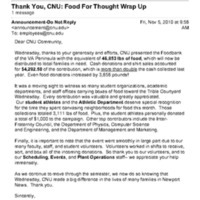 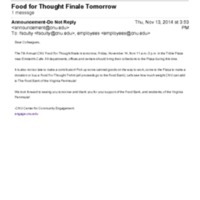 An email notice of the Food for Thought's Weight of Hunger Challenge to CNU departments. 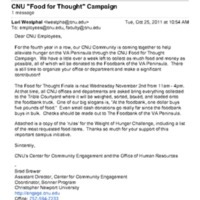 Email announcing the finale of Food for Thought campaign on November 15, 2013. 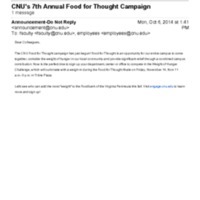 Email announcement of CNU's 7th Annual Food for Thought Campaign.